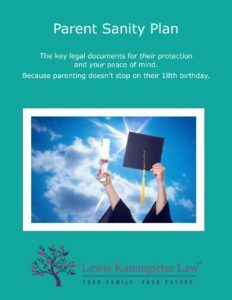 Parent Sanity Plan - Lewis Kannegieter Law, Ltd.
Once your child legally becomes an adult you can no longer make legal or financial decisions for them. But let’s face it….your job of being a parent doesn’t stop just because your child turns 18. If there’s a medical emergency or your child asks for financial help, you NEED the ability to cut through the legal red tape and get involved. As a legal adult your child now requires the same legal documents that you have to prepare in case of an emergency. A Health Care Directive, a financial Power of Attorney, and releases for various types of information can mean the difference between acting quickly in your child’s best interests or a costly drawn out court process. At Lewis Kannegieter Law, Ltd. we offer the Parent Sanity Plan designed to protect your adult child and give you peace of mind. This plan provides your adult child an introduction to estate planning concepts, advice, and the preparation and signing of these critical documents. The Parent Sanity Plan for qualified young adults includes the critical legal documents necessary for young adults at a flat fee of only $250. We also offer a Parent Sanity Plan Workshop that provides these same documents presented in a group format (with a minimum of 6, maximum of 11 participants) at a discounted rate of $125. You can ask about any upcoming workshop dates or get some friends together and schedule your own workshop date. A Docubank membership can be added to any Parent Sanity Plan. What it means legally to have your child become an adult and how a Parent Sanity Plan can save you money and undue stress. The legal documents necessary to protect your child and save your sanity. How a Financial Power of Attorney can be useful in daily transactions and critical in an emergency. Why a Health Care Directive is necessary for avoiding a costly guardianship proceeding. How a DocuBank membership can provide 24/7 peace of mind.